Architectural splendor, heaven for metrosexuals, an ideal place for knowledge seekers, culture with deep pockets and tantalizing foods; all these things define Delhi. This metropolitan is undoubtedly the bee’s knees for all the tourists around the world. Delhi, as a matter of fact, is the capital of India and has always been the center of attention for travelers. There are many reasons why tourists step out to roam around the beautiful Delhi. Drop-dead gorgeous spots and easy on the eyes heritage cast a spell over visitors due to architectural beauty nonpareil to any other place in the world and this is what, for decades, Delhi is in limelight for. In order to meet up with the exigencies of plenty of travelers, Delhi offers spots more than you can shake a stick at, to set off every style and budget accommodation. Below, we have drawn up a list that can cater all your needs if you are a backpacker and stretching your legs for a cheap and comfortable hostel out there in Delhi. Clean dormitories, up-to-date interiors, common sitting room and peaceful environment, that’s what the Jugaad hostel is all about. The super exciting thing about this hostel is that it provides a perfect atmosphere for digital nomads because there are loads of cafes, restaurants, art stuff and much more around. That means, this hostel is going to have your thanks for its classic and magnificent atmosphere. Jugaad hostel is located in the stinking rich South area of Delhi. The atmosphere is tremendously beautiful and refreshing with superb decoration inside and out. Jugaad hostel is the top choice if you are after a luxurious stay in a decent budget. There’re a lot of options for rooms, that said, the regular dorms have 8 beds, and there’s an all-female dorm with 6 beds. If you’re hoping for more privacy, the hostel has got private twin rooms options too. The Hosteller is located in the heart of the city. You can enjoy the royal comfort at pocket-friendly rates. There’re different dormitories for men and women and even private rooms too if you are looking for privacy. Moreover, if you are a kind of metrosexual, this place is going to hit the nail on the head as this place is within the earshot of shopping complexes and clubs. Because of being very close to a metro station, different attractive monuments are easily accessible from this place. Thanks to all these facilities, it’s one of the best-budgeted hostels in Delhi. Backpacking in Delhi in particular and India, in general, is one hell of an experience. Exploring Delhi all day will make you super-tired and thus finding a place to rest is absolutely necessary. We are pinning our hopes on this hostel guide to make it easier for you to find a comfortable hostel for yourself and find a little break from the all of the city’s chaos. Situated right at the heart of Paharganj and opposite side of New Delhi Railway Station, the Zostel is another best budget hostel in Delhi. Just pay this hostel a call and you will become a fan forever. This buddy-buddy hostel, due to its striking location, receives huge admiration from all the travellers. It’s very close to the airport metro and a short walk away from the train station. Zostel is basically located on a hotfoot street of Paharganj and often it’s the first halt for International jet-setters before exploring Delhi. The coruscating common rooms, super jaunty bedrooms are the hallmarks of the Zostel. Zostel offers bedrooms with eight-beds or six-beds as per the requirements of the guests. However, if you are laying your eyes on the privacy, then Zostel still provides the best deals. You can avail deluxe rooms having two single beds just like the hotel room, but that comes with a little expense. What’s good about this place? 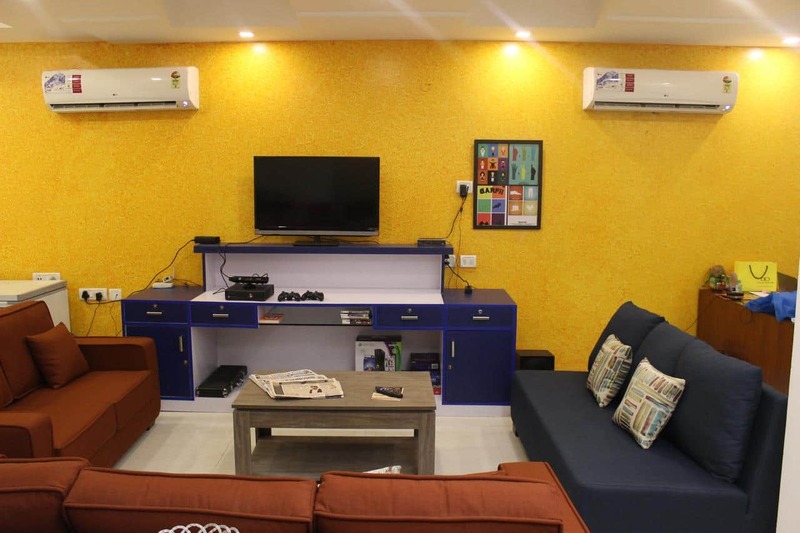 Here starts your excitement game in Delhi, the Madpackers hostel. Madpackers is an incredible hostel in the leafy area of South Delhi. There is no denying the fact that while staying at hostels in a crowded city like Delhi, security and convenience are two of the most important factors one might consider. Madpackers save you from all those worries as it is located in a pretty safe and suitable-for-tourists area. The access to public conveyance is the last thing you would be worried about while staying in Madpackers as it is in the vicinity of metro’s yellow line. In addition to that, this place has a lot of bells and whistles to appeal to your taste and senses. Madpacker’s administration makes sure you stay remains uber-comfortable. Another plus point of residing in this hostel is that the adversity of tourists here allows you to enhance your social circle by making a lot of friends from different regions of the world. This hostel presents itself completely through its name “Stops”. It’s a must stop hostel and it makes you leave a piece of your heart right there when you leave. The Stops is one of the best backpacking hostels in Delhi situated at the intersection of Old and New Delhi. Also, there are three metro-stations on the walking distance so that you don’t have to go through any hustle in finding the public transportation. An out-and-out variant to most hostels of Delhi, Stops sings its own praises in the words of its colorful walls, wooden flooring, and comfortable beds. The staff at Stops is very welcoming and makes your stay at Stops worthwhile. Stops offer a lot to keep you settled in such as the library which is stuffed with a huge stock of books, documentaries and films, well-ventilated terraces and common kitchens where you can carry out all your culinary experiments. What’s thin on the ground? The Joey’s hostel is one of the best hostels for backpackers in Delhi. Situated next to Yamuna River, this hostel is specifically designed for the budget backpackers and it’s pretty close to Laxmi Nagar metro station. A highly friendly staff is there to provide the guests with assistance and will go out of the way to make you feel at home. It’s clean and wonderfully decorated. It has got many communal places where you can find cool people. That’s what any backpacker loves to be at. There are 10-bed, eight-bed, six-bed and four-bed dormitories, at different rates. Joey’s Hostel also knocks some tours into shape around the city, apart from providing accommodation. This hostel is not located at the main backpacker area of Paharganj, it is in the east of Paharganj. There’s a reliable and working security system for the safety of the guests. Across the board, it’s a fantastic place to hang on. Fantastic location makes BoriBista a second to none place to stay in Delhi. It’s a simple yet magnificent place for backpackers due to its tie-in with public transport like metro and taxis. BoriBista is situated in the center of South Delhi and you will thank this place for connecting you with all of the major attractions of the city. There’re a bunch of options for dormitories such as female-only bedrooms. And if you want to enjoy full privacy, that most of the solo travelers do, there’re private rooms with large beds too. This hostel is fully equipped with all the basic facilities you will be hoping for; a shared kitchen for your favorite meals but you can have a special diet on request, a rooftop terrace and common living rooms to sit and just refill yourself out there. Its elegant common room is fixed up with contemporary styling where all backpackers can enjoy a lot of fun facilities including Kitchen, Games Space, Books, Lounge, and Television. The hostel is 12kms away from the International Airport. So, what else would a backpacker want? What’s good about the place? The writer of this guide works for Parcels To India, a company that offers cargo services from the UK to all over India. This has given her a chance to explore all the areas of India. The post 7 Best Hostels in New Delhi for Backpackers 2019 appeared first on Traveling Lifestyle.